If you're a graduate student in a student affairs masters program you're probably learning a lot of the same things that I learned 10 years ago when I was an "SA grad." If you look at the coursework for most student affairs masters degree programs in 2016, I bet it looks quite similar to the coursework from 2006. And, if you take a look at the technology-based components of 2006 and/or 2016, the differences are likely not that distinct. Of course there are going to be programmatic exceptions (which might actually be exceptional). However, it should be noted that the profession didn't add a technology competency until 2015 . 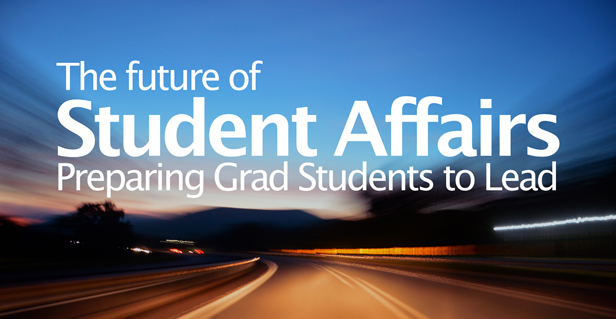 Student affairs graduate programs in their current iterations haven't exactly been leading the charge for a more technologically-savvy and digitally-present profession. Now, I know that this is a bit harsh, but we absolutely have to nudge this profession into the digital era of an ever-changing higher education landscape. Preparing student affairs graduate students to lead on a modern campus  is one of the core elements of a student affairs masters program...and if it's not, it should be. What student affairs graduate students actually think about social media and digital presence in terms of their current academic experience as well as why “getting digital ” is important for career success . Information on digital presence and why it’s important for student affairs practitioners at all levels . Joining us on the webcast will be student affairs graduate students from the University of South Alabama who are in a Digital Leadership course developed by Dr. Delmas as well as SA grad students at Fort Hays State University. It's going to be interesting to hear directly from students who are currently in higher education administration/leadership programs on how they perceive the overall digital fluency of the profession, the level of inclusion of technology in their grad programs, and their views on how social media and digital presence  matter to the modern student affairs practitioner.